Prepare the sauce while the pasta is cooking to ensure that the spaghetti will be hot and ready when the sauce is finished. It is very important that the pasta is hot when adding the egg mixture, so that the heat of the pasta cooks the raw eggs in the sauce. 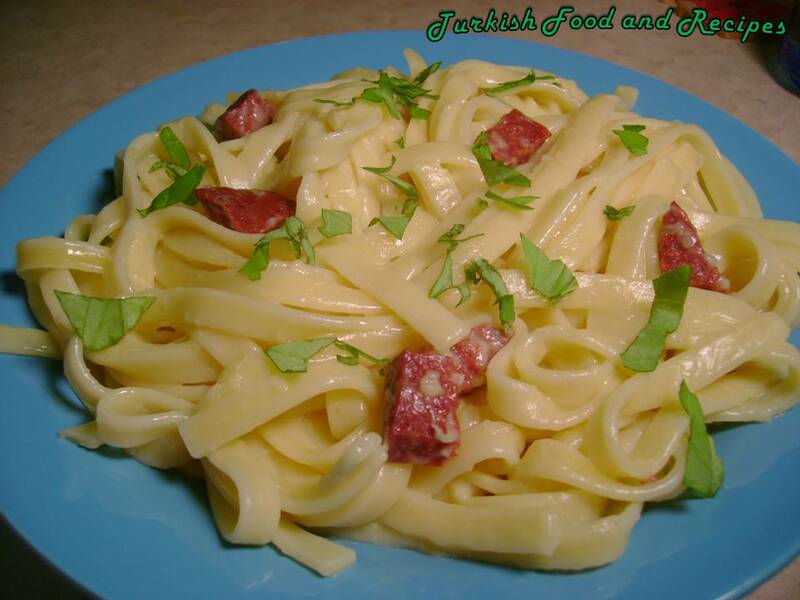 Cook the pasta in salty boiling water for 8 to 10 minutes or until tender yet firm. Drain the pasta and reserve 1/2 cup of the starchy cooking water to use in the sauce if you wish. Meanwhile, heat the olive oil in a deep skillet over medium heat. Add the sujuk and saute for about 3 minutes, until is crisp and the fat is rendered. Stir in the garlic and saute for less than 1 minute to soften. Mix the hot pasta and the sujuk over the heat to keep hot. Beat the eggs and Parmesan together in a mixing bowl, stirring well to prevent lumps. Pour the egg/cheese mixture into the pasta, whisking quickly until the eggs thicken, but do not scramble (this is done off the heat to ensure this does not happen.) Thin out the sauce with a bit of the reserved pasta water, until it reaches desired consistency. Season the carbonara with ground black pepper and taste for salt. Take into warm serving plates and garnish with fresh parsley. Sprinkle with more cheese if desired. Makarnayi tuzlu suda yaklasik 8-10 dakika haslayin. Bu sirada sosu hazirlayin ve makarna sicakken sosun hazir olmasi gerektigini unutmayin. Yumurtali sosu makarnaya ilave ederken, makarnanin sicak olmasi cok onemli, cunku cig yumurtali sos sicak makarna ile pisecektir. Bir tavada, zeytinyaginda sucuklari orta ateste sote edin (yaklasik 3 dakika). Sarimsagi ilave edin ve bir dakika dolmadan atesten alin. Haslanmis makarnayi suzun ve yaklasik ½ su bardagi pisirme suyunu daha sonra sosta kullanmak icin ayirin. Makarna ve sucugu atesin ustunde guzelce karistirin. Yumurta ve parmesan peynirini bir kapta guzelce cirpin. Atesin altini kapatin ve sosu makarnaya hizlica karistirarak ilave edin. Yumurtali sos koyulasana dek iyice karistirin. Arzu ederseniz sosu biraz sulandirmak icin onceden ayirdiginiz makarna haslama suyunu ilave edin. Karabiber ve tuz oranini istediginiz gibi ayarlayin. Karbonarayi servis tabaklarina alin ve arzuya gore maydanoz ile susleyin. Uzerine Parmesan serpebilirsiniz. Hello there! I want to thank you for your website! I just moved to Turkey from Philadelphia, PA. Having translations have not only helped me to cook, but more importantly, to shop in Turkey! I wanted to share one note of English with you. The abbreviation for Tablespoon always has a capital "T." It helps to differentiate from the lower case tsp. Thanks again! Made this recipe tonight and everybody loved it. Used hot sujuk sausage and bow tie noodle pasta and it came out great. Thanks for sharing the recipe...this one will definitely be going into my regular rotation!